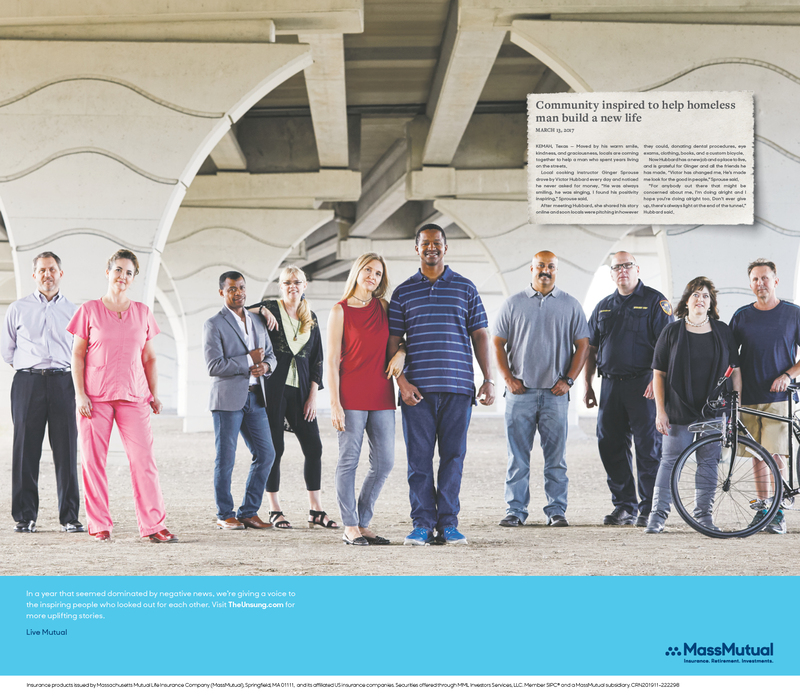 After all the negativity of the year, we wanted to bring to life a simple truth at the heart of the MassMutual brand: people are looking out for one another all around us. We uncovered uplifting stories of people helping people that had been overshadowed by political rancor, global conflict, and natural disasters, then traveled around the country to tell these stories in a two-minute film. Inspired by typical year-in-review films typical at this time of year, this was our way to reframe the prevailing negative view of 2017. To give these beautiful stories a chance to inspire America, we partnered with CNN’s Great Big Story to produce short documentaries that dove deeper into each story. And regional newspaper ads told different stories based on location. And to end the year on a high note, we flew our heroes featured in the brand film to New York City for a special New Year’s Eve performance in their honor. Broadcast live on CNN in the last moments of the year, the performance inspired all who saw it to Live Mutual in the new year.